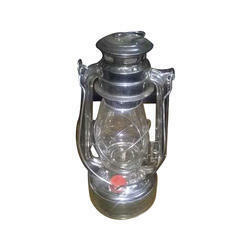 Our company is engaged in offering a huge assortment of Galvanized Kerosene Lantern (Item Code: 01020297). These are available in Shiny Polish finish and are greatly appreciated for their attractive designs and mesmerizing looks. Our lanterns are fabricated by making use of Galvanized metal for durability and reliability. We offer these lanterns in a standard 32X17.50X14 cms size. We have carved a niche amongst the most trusted names in this business, engaged in offering a comprehensive range of Prabhat Kerosene Lantern.